A group of twelve older people living in the Brick Lane area and twelve year 3 pupils from Christ Church C of E Primary School, Brick Lane worked together in to create a series of large scale paintings, Frames of Brick Lane, exploring the living history of the local area. 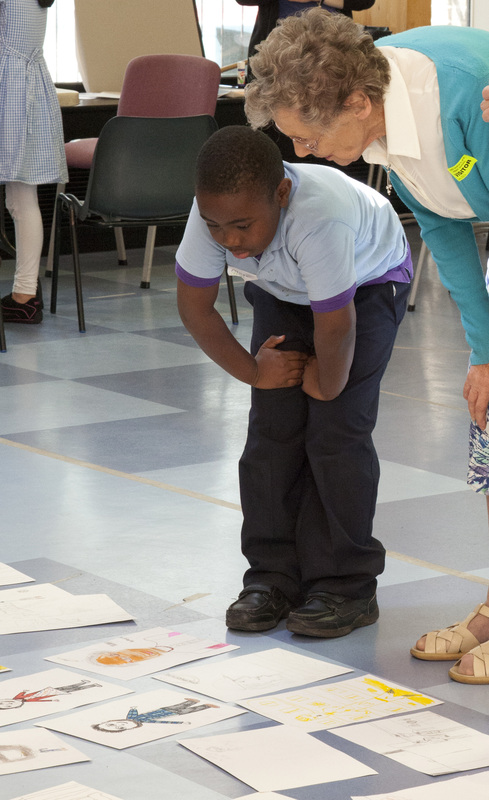 Using drawing and poetry, storytelling and map-making the group met weekly throughout the summer term in 2015, working with Magic Me artists, storyteller Surya Turner and artist & illustrator Ben Connors. Together the group researched and learned about the history and stories of people and places in the local area around Christ Church School, with pupils’ families taking part in their research, sharing stories about how their families came to Brick Lane and Whitechapel. Both old and young shared their personal experiences and memories of the local area, and found connections across the generations, which they used as inspiration for four large scale paintings. When I first worked with my older partner she said she hated drawing, but after a few weeks I saw her drawings and they were amazing! I found that the enormous energy of the children enthused us all. We seniors dived in, bringing our knowledge and experience of years of living in the East End. It was a perfect combination. The project has been run by artists from Magic Me, an intergenerational arts charity that aims to build stronger, friendlier communities by bringing together old and young who might not otherwise meet, to learn, share and create together. It has been fun and exciting to see the impact that spending time with the older people has had on the children. They have loved it and the exchange of stories and ideas has been inspirational and wonderful to see. As a neighbour to Brick Lane we’ve been committed to supporting our local communities and celebrating the diversity around us for many years, and we are very proud to support this wonderful learning initiative. The paintings were on show to the public from 13 July to the end of August 2015 in the foyer of Allen & Overy’s offices in Bishops Square, E1, and were then installed permanently in the school’s community space, the Garden Building from the autumn. All workshop photos: Helen Jermyn for Magic Me. Artwork created by Ben Connors, working with the Magic Me – Frames of Brick Lane group. With thanks to Allen & Overy for their financial and volunteer support.